The role of endogenous salicylic acid (SA) signalling cascades in plant responses to salt and oxidative stresses is unclear. 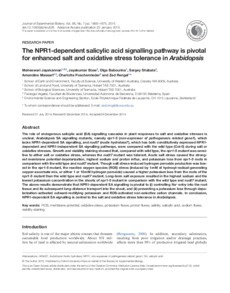 Arabidopsis SA signalling mutants, namely npr1-5 (non-expresser of pathogenesis related gene1), which lacks NPR1-dependent SA signalling, and nudt7 (nudix hydrolase7), which has both constitutively expressed NPR1-dependent and NPR1-independent SA signalling pathways, were compared with the wild type (Col-0) during salt or oxidative stresses. Growth and viability staining showed that, compared with wild type, the npr1-5 mutant was sensitive to either salt or oxidative stress, whereas the nudt7 mutant was tolerant. Acute salt stress caused the strongest membrane potential depolarization, highest sodium and proton influx, and potassium loss from npr1-5 roots in comparison with the wild type and nudt7 mutant. Though salt stress-induced hydrogen peroxide production was lowest in the npr1-5 mutant, the reactive oxygen species (ROS) stress (induced by 1mM of hydroxyl-radical-generating copper-ascorbate mix, or either 1 or 10mM hydrogen peroxide) caused a higher potassium loss from the roots of the npr1-5 mutant than the wild type and nudt7 mutant. Long-term salt exposure resulted in the highest sodium and the lowest potassium concentration in the shoots of npr1-5 mutant in comparison with the wild type and nudt7 mutant. The above results demonstrate that NPR1-dependent SA signalling is pivotal to (i) controlling Na+ entry into the root tissue and its subsequent long-distance transport into the shoot, and (ii) preventing a potassium loss through depolarization-activated outward-rectifying potassium and ROS-activated non-selective cation channels. In conclusion, NPR1-dependent SA signalling is central to the salt and oxidative stress tolerance in Arabidopsis.